With the recent release of the findings from the soon-to-be-published 2014 State of Women-Owned Businesses Report (here’s a link to the news release; the full report is coming soon), we now have the most up-to-date accounting of the number and growth trends among women-owned businesses in the country. As of 2014, we (Womenable authored the report, which will be published soon by American Express OPEN) estimate that there are 9,087,200 majority-owned and privately-held women-owned firms, employing 7,854,200 employees in addition to the owner, and generating over $1.4 trillion ($1,410,940,800,000) in revenues. Between 1997 and 2014, when the number of businesses in the United States increased by 47%, the number of women-owned firms increased by 68% – a rate 1-1/2 times the national average. Indeed, the growth in the number (up 68%), employment (up 11%) and revenues (up 72%) of women-owned firms over the past 17 years exceeds the growth rates of all but the largest, publicly-traded firms – topping growth rates among all other privately-held businesses over this period. Nationally, the number of women-owned firms has increased by 68% since 1997. The states with the fastest growth in the number of women-owned firms over the past 17 years are: Georgia (up 118%), Texas (98%), North Carolina (91%), Nevada (91%) and Mississippi (81%). In terms of growth in combined economic clout, however – meaning averaging together the rankings in growth in the number, revenues and employment of women-owned firms – the states in which all of these measures combined place women-owned firms in a much better than average position over the 1997 to 2014 period are: North Dakota, the District of Columbia, Nevada, Arizona and Georgia. In 1997, there were just under 1 million (929,445) firms owned by women of color, accounting for one in six (17%) women-owned firms. That number has skyrocketed to an estimated 2,934,500 as of 2014, now comprising one in three (32%) women-owned firms. Firms owned by African American women number an estimated 1,237,900 as of 2014. These 1.2 million firms employ 287,100 workers in addition to the owner and generate an estimated $49.5 billion in revenue. Firms owned by Latinas number an estimated 1,033,100 as of 2014. These firms employ 433,600 workers in addition to the owner and generate an estimated $71.1 billion in revenue. Firms owned by Asian American women number an estimated 675,900 as of 2014. These firms employ 699,200 workers in addition to the owner and generate an estimated $115 billion in revenue. 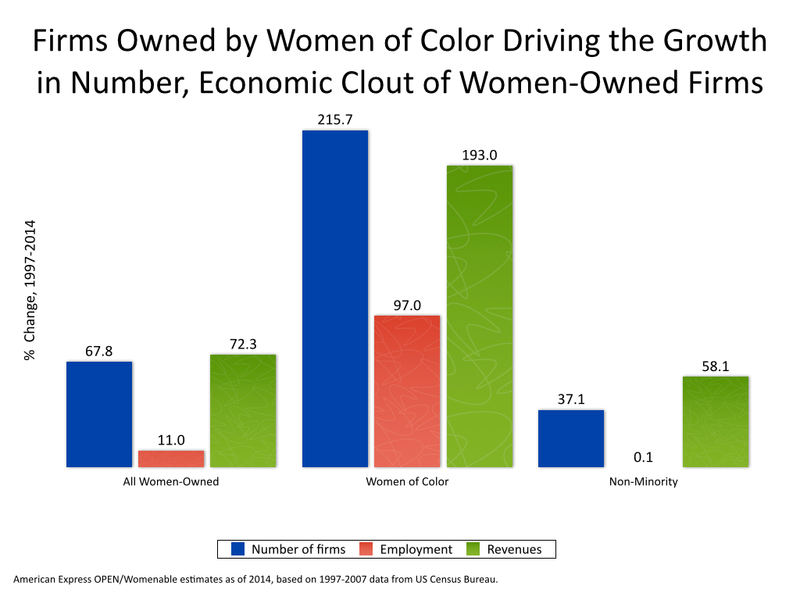 While firms owned by women of color are smaller than non-minority women-owned businesses both in terms of average employment and revenues, their growth in number and economic clout is generally far outpacing that of all women-owned firms. Indeed, the growth in the number of African American (up 296% from 1997 to 2014), Asian American (+179%), Latina (+206%), Native American/ Alaska Native (124%), and Native Hawaiian/Pacific Islander (+247%) women-owned firms all top the growth in the number of non-minority women-owned firms (+37%) over the past 17 years. 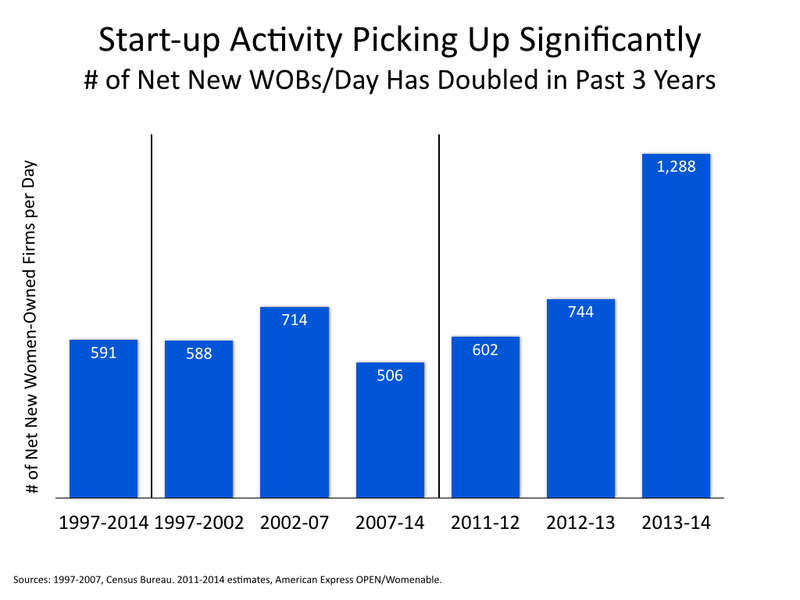 New this year is a look at business start-up activity, which shows that there are an increasing number of women business owners at the starting gate. On average over the past 17 years, there has been a net increase* of 591 women-owned businesses each and every day. The number of net new women-owned firms has fallen in the wake of the recession – there was a net increase of 714 women-owned firms per day from 2002 to 2007, and a lesser 506 per day between 2007 and 2014 – but start-up activity is increasing. Just in the past year, there have been an estimated 1,288 net new women-owned firms launched each and every day. What’s the bottom line? Women business owners are not only here to stay, they are moving into entrepreneurship in equal numbers. The challenge that remains is moving women-owned firms up the growth continuum, and gaining a greater understanding of impediments to growth and how best to follow a woman’s path from a start-up with promise to a successful business that moves beyond the “majority-owned, privately-held” category to being woman-led and perhaps publicly-traded. But that’s a topic for another day! The full report provides detailed data at the state level, industry level, and by size of firm, so stay tuned to womenable.com; the report will be posted there as soon as it’s published. * “Net increase” takes into account all of the new women-owned firms minus the number of women-owned firms that either ceased operations or ceased to be majority women-owned. This entry was posted in entrepreneurship research, women business owners, women's business ownership, women's business research studies, women-owned business and tagged American Express OPEN, statistics, women's enterprise, women's entrepreneurship, women-owned business, Womenable by womenable. Bookmark the permalink.